I haven't really spent a huge amount of time in game lately, but when I have been playing, a good chunk of that time has been spent on Iokath. For all its flaws, I've been enjoying just having a new zone to run around and hang out in, and for me, trying to overcome some of the issues with the dailies and finding the fun in them has been part of the challenge. 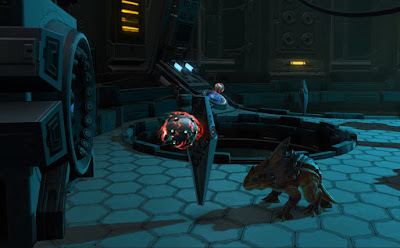 For those of you who are less interested in that kind of thing and have maybe been holding off on doing Iokath for fear of getting frustrated with it - whether based on early experiences or on other people's reports - let me share some tips. First off, as I mentioned in my original post about the Iokath dailies, the weekly requires you to do ten of them, but the terminal only hands out five a day from a larger, rotating set. So my first advice is to make some room in your mission log, visit the terminal every day, but don't bother with actually doing the dailies every day - let them build up in your log until you have ten or more so you can get the weekly done in one go. Several of the quests also overlap in their objectives, making it that much more satisfying to be able to get several things done at once. This is the best daily ever. Don't leave that one in your log if you happen to pick it up on any given day, but go and do it right away so you can pick it up again as soon as it comes back up. It's the "turret daily" that takes place in the same phase as several of the story conversations, so it's just around the corner from the mission terminal and only takes about two minutes. Basically, you enter the turret, and then just press one until everything is dead. (If you like, you can also press two every now and then, but it's not strictly necessary.) So relaxing. As a bonus, this daily was included when Bioware buffed the rewards for all the "vehicle dailies", even though this one doesn't require you to buy anything, so it offers a pretty large reward for very little effort. The docking ring is the area where you originally landed during the storyline, just an elevator ride away from where you spawn on Iokath after having completed the story. There are a total of four different missions to be completed in here: Defending the Docking Ring, Disarm, Disrupting the Network and Subverting the Tower Droids, though I haven't seen the first one of these actually come up as part of the rotation yet. Obviously collecting all of these and then being able to do them all at once would be great, but I haven't had much luck with getting more than one or two of them at a time. I don't know if there's some sort of limit on how many quests of a certain "category" you can hold at once or if I've just had bad luck. Either way, doing any of the missions in here isn't too bad even if one of them is all you've got. 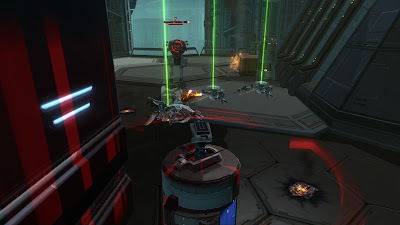 It's worth noting though that "Disarm" can also be done outside the docking ring, in the "main part" of Iokath, as there are several of those laser emitters near the weapons factory, which are clickable and count towards mission completion as well. 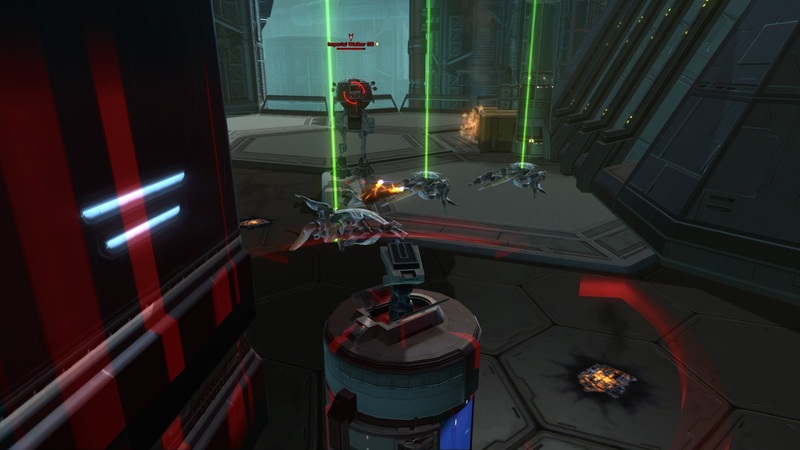 The weapons factory is at the very southern end of the Iokath map and thereby the objective that's the furthest away from where you spawn, but once you get inside, the objectives there are fairly painless to take care of as well (Monitoring the Situation and Powering Up the Weapons Factory). In fact, I find the latter (where you "steal balls" from the little remotes) quite cute and fun. Kill quests sound super boring on paper, but I actually don't mind them on Iokath because they are the easiest missions to combine with something else. There are three different ones, one to kill 50 droids of any kind, one to kill 25 scour swarm droids and one to kill 25 caretaker droids. The first one will pretty much take care of itself if you're doing the rounds pursuing other mission objectives. The same is more or less true for the last one since caretaker droids are everywhere, and there are a lot of them in the docking ring in particular. The scour swarm droids are the only slightly annoying ones, as they are heavily concentrated in and around bodies of water (the dark blue splotches on the map), where you don't necessarily need to go for anything, so it can require going out of your way to achieve the required kill count. However, I still recommend leaving that until the very end of your daily round, just to see how many kills you can rack up on the way anyway. Then you just have to mop up the last couple to complete the quest. Personally I find this mission very annoying because it forces you to drive all around the houses to scan the five different landmarks, and mobs will slow you down everywhere. Maybe it's not as bad if you play a stealth class. That said, it gets a bit easier once you're comfortable with where to find all the objectives, and you can use this mission as a sort of path to follow while working on the different kill quests. I haven't actually seen Systems Offline in game yet, but as far as I gather it's simply a reversal of Systems Go. The latter has you turning on plasma emitters near your faction's base, so I guess the former should have you turning them off near the enemy base. This mission is very annoying simply due to its lack of available objectives. You're supposed to activate four of the emitters, but there's only a total of four or five around, and they are slow to reset. For extra confusion, they are surrounded by identical-looking emitters that never turn themselves off, so you kind of need to learn which ones might even turn out to be clickable at some point. I always get a lot of mob killing done while doing the rounds around the area with the emitters, but if it's too badly camped I usually just move on to something else for a while. The vehicle dailies are a mixed bag. Even after Bioware buffed their rewards, my criticism of them costing more than they reward still stands. The walker one is probably my least favourite because it's the most expensive and I don't find the walker particularly fun to use. Several of its abilities are actually extremely weak, so that stomping on everything still seems to be the most efficient strategy. The forty kills as a walker can nicely be combined with some of the other kill quests, however what annoys me is that apparently you can't loot while in a vehicle (anymore - you used to initially but this past week it would not let me do so anymore). Having to stomp around Iokath to kill forty droids, leaving a trail of shiny beams behind which I'm unable to loot, would personally drive me nuts, so I probably won't do that one again unless they re-enable the ability to loot while piloting a vehicle. The daily to kill ten mobs as a monitor initially earned my wrath when my first one died after two kills, making me feel like I'd wasted my shards. Once you get to hang of how it works though, it's actually pretty quick and kind of relaxing. (A mission where you get stunned for six seconds after every attack doesn't exactly make for fast-paced gameplay.) Personally, I found that the best place to do this daily was right outside your faction's base, on the upper level where most of the plasma emitters are. There's a bunch of sluggish drones there that only come in ones or twos, so you can kill them off without immediately dying yourself when the stun kicks in. Just remember to heal back up after every fight. The mouse droid mission is a bit unintuitive at first, because your droid only has one ability - a self-destruct - and it doesn't do enough damage to one-shot a walker. So... what exactly are you supposed to do? One easy solution is to group up with friends, so they can bring the walker low for you and you only have to finish it off. 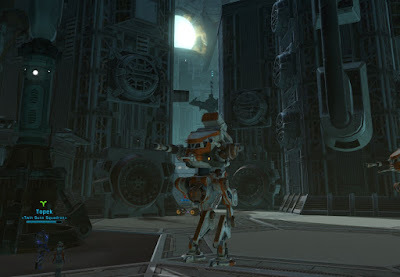 However, I soon learned that there is a way to solo the walker, which involves aggroing it and letting the various Iokath droids in the area slowly whittle it down. I recorded a video of how to do it and I can already tell that this was a niche just waiting to be filled, as the video organically achieved over a hundred views in only four days. Anyway, the point is, now that I know how to do it, I don't mind this daily either, especially as it's the cheapest of the three vehicles to purchase. I think this mission doesn't fit in with the rest simply because it's meant to be done in a raid, which is not exactly ideal daily material, but more importantly it doesn't even tell you that you need a group. If you were scratching your head about how you were supposed to solo a mob with world boss levels of health, the answer is: you aren't. Unfortunately the quest is also currently bugged (even though the last patch was supposed to fix this), so that only one group in the raid gets credit for quest completion (usually the group of the person that initiated combat, from what I've seen). For what it's worth, the boss isn't hard... it only requires one tank, one healer and some dps, with a larger group making the kill faster obviously. But what with the bugginess and the lack of rewards, it's currently simply not a worthwhile endeavour beyond doing it once to say that you got the achievement. The achievements panel and Dulfy's guide to Iokath list another couple of dailies that I still haven't seen after nearly four weeks of running the missions - one has to wonder if Bioware intentionally took them out or accidentally disabled them. To supplement the "Disarm" hint listed above, there are also two emitters directly beside the Imperial side of the northern-most teleporter. There aren't any on the Republic side, however, so if you decide to search Iokath's main area for these emitters you'd still need to go down to the five near to the Weapons Factory if you aren't content to just wait by these two additional ones. Scratch the first point of the second paragraph; there are two laser emitters on the Republic teleporter; they're attached to two curvy-looking structures a little way out either side of the teleporter. Excellent tips, definitely going to use them! For disarm, I guess you're already aware of the two emitters on the bridge in the south, near where you can scan several of the structures in that same area. I've never not seen them active in my times doing the dailies. Also, if you enter the weapons factory through the door in the south, rather than the tram, there's a whole lot of scour swarm droids to fight through, which should help with that quest as well.